We continue to raise awareness today so tomorrow we don’t have to. 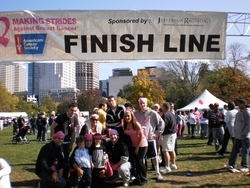 Premier Management Group, a sales and marketing firm based in Hartford, Connecticut, recently participated in the Strides Against Cancer Walk, a charity event aimed to show the progress that is being made together to save lives by helping people get well, stay well, find cures, and fight back. The Strides Against Cancer Walk of Hartford, CT, took place at Bushnell Park in downtown Hartford, Connecticut. President of Premier Management Group, Michael Catherwood, and the Premier Management Group team rallied to raise money and awareness to a very important issue that affects millions of women and families. The team at Premier Management Group showed up early to register, participated in opening ceremonies, took advantage of the group calisthenics that was offered to participants, and alongside hundreds of people, began making strides against cancer. The Strides Against Cancer Walk is near and dear to the hearts of the Premier Management Group team and hits home a little more than most, as some team members have friends currently battling the disease. Rather than stand by and hopelessly watch their battle, participating in this walk was their way of showing love and support for these women. Follow Premier Management Group on Facebook and Twitter! Premier Management Group is a management, sales and marketing firm that specializes in meeting the needs of Fortune 500 clients. They have a unique approach to direct marketing that allows them to provide these clients with the results they are looking for. They focus on relationship building through face to face customer interaction which delivers lifelong customers while increasing brand recognition for their clients. For more information please call 860.586.7037 or visit http://www.premiermanagementgroup.org/.